Louisiana Secretary of State Tom Schedler says the U.S. Department of Justice was attempting to violate the right to privacy of every Louisiana voter with an unprecedented attempt to seize confidential files maintained by his office. Attorney General Eric Holder sought the records as part of a suit he filed against Schedler, alleging that Louisiana has violated voting rights on a massive scale. The records include each voter’s date of birth, mother’s maiden name, and Social Security number. Schedler said the DOJ has no right to such sensitive information, which could compromise citizens’ financial and personal lives. 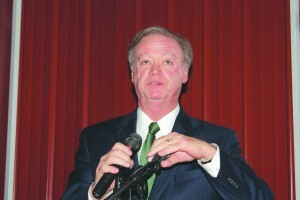 The DOJ recently filed documents backing off some of its demands but is continuing with its suit against Schedler, who will discuss the suit at Tuesday’s Ronald Reagan Newsmaker Luncheon at Café Américain, 7521 Jefferson Hwy. in Baton Rouge. The reception begins at 11:30 a.m. and the lunch at 12 noon. The DOJ said that it has gotten some of what it wanted as a result of a separate suit filed by the NAACP in New Orleans. The NAACP and other plaintiffs won that suit and are seeking more than $3 million in attorney fees from the state. However, the Secretary of State did not turn over any confidential personal data from the voter files as a result of that suit. Critics of the Department of Justice suit say it is part of a concerted effort by the Obama Administration to collect data on millions of American citizens without their permission. The DOJ has contracts for data analysis with a firm that also maintains voter files on more than 170 million voters for Democratic candidates. Critics such as Lionel Rainey say there is little to prevent Democratic operatives from having access to that information. • GOP candidate for Congress Paul Dietzel II will explain why he is running and update attendees on his campaign. • Metro Councilman Ryan Heck will explain his efforts to reform the Capital Area Transit System (CATS) Board. Heck was appointed to the CATS board earlier this year and has led efforts to privatize the management of CATS. The Reagan luncheon is open to registered Republicans, guests, and members of the media. Lunch is $15.